A Sheffield administrator’s knowledge of personal and corporate insolvency has placed her first in the country for budding insolvency practitioners. 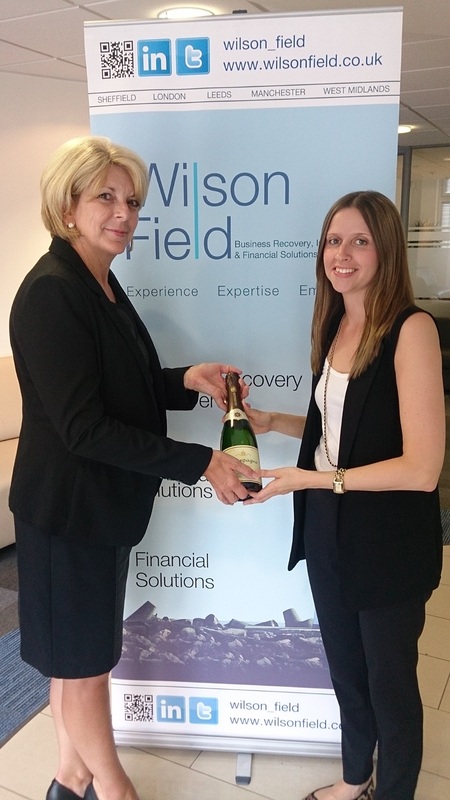 Debbie Wing (29) who works at Wilson Field, finished in pole position in the results table for the annual Insolvency Practitioner Association (IPA) Certificate of Proficiency in Insolvency (CPI) examination. The early mornings and late nights of studying paid off for Debbie who scored 75% in the exam taken by 200 people this year and who will attend a formal dinner with the IPA in September to collect her accolade. “I had been on training courses, revised and put in lots of preparation for the three hour exam back in June. It was a mixture of multiple choice, short answers and essay style questions testing me on legislation and practice with a big emphasis on corporate insolvency. Debbie, who is a University of Sheffield English literature graduate and has been at Wilson Field nearly three years, now has the option to become an insolvency technician and will be able to study towards the Joint Insolvency Examination Board exams. “The IPA’s CPI exam has been long established and is widely acknowledged as an important intermediate insolvency qualification. It is also widely regarded as a notoriously difficult qualification. Business turnaround and insolvency specialist Wilson Field, which has offices in Sheffield, Leeds, Birmingham, Manchester, Bristol, Cardiff, Swansea and Durham, has witnessed consistent growth over the last three years. It currently has around 90 staff including seven insolvency practitioners and a large team of experienced and dedicated industry professionals.